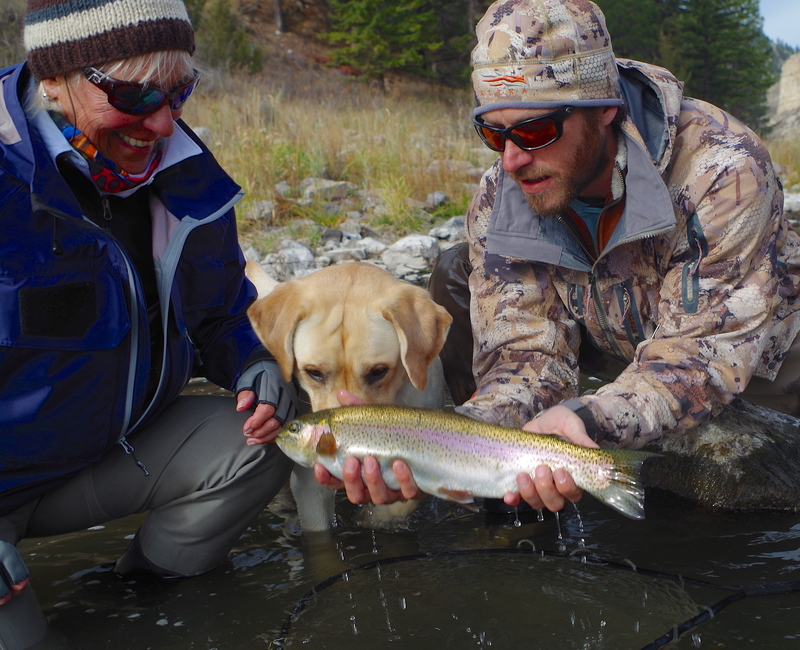 Everyone loves admiring big Rainbows in Autumn! Late Autumn is here with an exclamation point! The mornings are at or below freezing, it “warms” up to the 40’s and 50’s in the afternoon and the wind blows steady. Sounds like steelhead weather to me! (More on that in a future post!) Why would you fish to the MO in mid-November? It’s not because of the awesome weather -it’s because of the awesome fishing and solitude. With the Missouri being a tailwater fishery (below a dam), the water temps are buffered from big swings -both daily and seasonally. When other rivers in Montana succumb to frigid temperatures (30’s) and the trout in those waters slow down and go into their more mellow winter mode, the Missouri it still going strong with water temps in the upper 40’s and low 50’s. As a result, the poikilothermic bugs and trout have a grand time in November. We will have heavy hatches of Baetis and Midges everyday and the trout will move to eat them. They will also chase streamers for that big bite of calories. While trout on the Blackfoot are chillin, the MO trout are chuggin. All the homeothermic angler needs to do is stay warm and they will be rewarded with a scrappy trout on the end of their leader! Our store in Craig is now close for the Winter, though our lodging will remain open all year long (we have special off-season rates!). We will be open on the nicer weekends this Winter as our main Craig man, Ben is living out there next to the shop. Pretty handy for a trout bum! Our Helena store will be our home base for the next 4 months or so and we’ll be holding our annual curriculum of classes this Winter starting in January – Fly Tying, Rod Building and Spey Casting. We will post that info in the next few days on or blog and on our website. We frequently sell out of our fly tying classes so if you are interested, please contact us ASAP. Medi with a big smile over a BIG Brown Trout on the Missouri in Autum! Streamers: Buggers (Black, Purple, Olive #4-#8), Sparkle Minnows (#4-#6), Flash Fly Zonkers (#6), JJ Special (#4-#8), Krelex Minnows. Best Techniques: Deep nymphing under an indicator will get lots of hooks up prior to bug activity (3′-7′ deep). There are still some weeds but nothing like October. Once you start seeing bugs and a few noses, try short leashing a Baetis-like nymph under small indicator (pinch-on or small thingamabober) or behind a large dry fly (Orange Stimi or #12 Parachute Adams). We have had some of those epic dry fly days already! Streamers are also pretty darn sweet. It’s been windy so the streamer and nymph gig have been better than the dry. Fishing Tip: When you get into finicky rising trout -or the light conditions are just too tough to see your fly, try putting a pinch-on indicator about 15-30 inches above your fly (flies). I even do this with my dry flies. When you are fishing a #20 or #22 gray colored dry fly on a cloudy day, you just can’t see it too well -or at all! Using the pinch on makes a huge difference. It’s also a good way to fish a small nymph just below the surface down to about a foot deep. I’m not a big pinch-on fan (or Sticky Tabs, as my friend, Dave, calls them) because they gum up your leader, you can’t adjust your depth and they make for a little piece of litter if your not careful with disposing of it. But for doing as described above is when I pinch those things on! 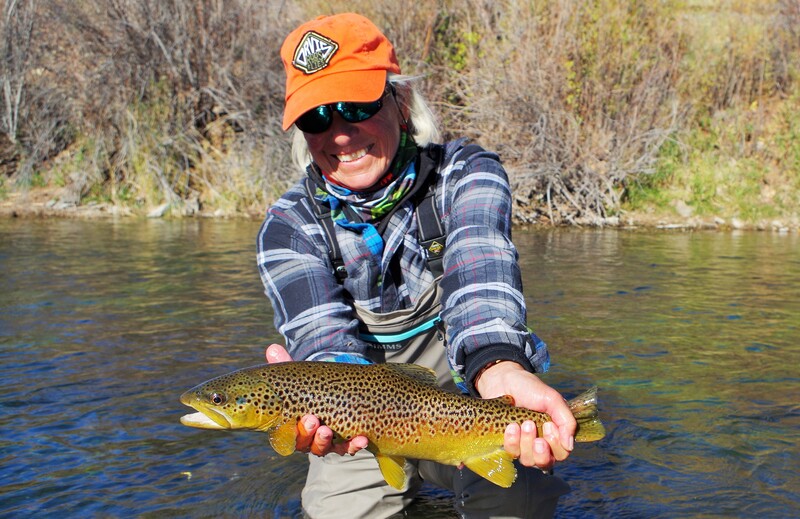 This entry was posted in CrossCurrents News, Fishing Reports, Missouri River and tagged Craig fishing report, Craig Montana, crosscurrents fly shop, dry fly fishing, Fishing Reports, Missouri River Fly Fishing Report, Missouri River Montana, Rainbow trout. Bookmark the permalink. Enter your email address to catch this blog and receive notifications of new posts by email.